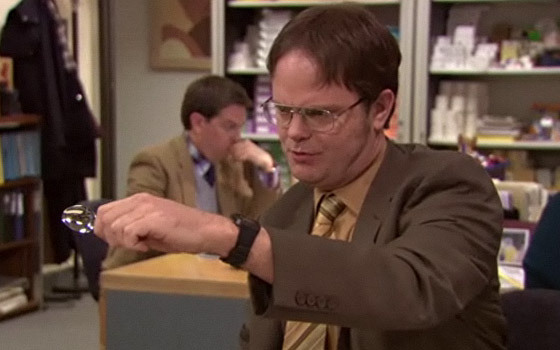 Commenting on our season premiere recap, Emily Nussbaum posited that the Andy-Dwight-Angela triangle was “like a dirtier, meaner, crazier parody of the original Jim-Pam-Roy plot.” We hoped Pam would leave Roy and run off with Jim, but Angela has never inspired anything similar, as much of a dope as Andy is. But it’s still the same plot. And it’s resolved in a dirty, mean, crazy way. Imagine if Jim and Roy had banded together and said, “Hey, she’s leading us both on. Screw it.” No one would’ve wanted to see poor Pam put through that. But Angela? Apparently she deserves it. Once the “dueling” Andy and Dwight (Andy pinning Dwight against a fence with his “silent when it goes under five miles per hour” Prius) realize that Angela had actually slept with both of them — only these dopes wouldn’t have put that together beforehand — they agree to keep their distance from her. Andy calls off the wedding, and Dwight throws away the bobblehead she gave him (probably the larger sacrifice). And Angela, because she could not make a decision, is left alone, scorned. It seems harsh (and unfair to let Dwight off the hook), but then again, Angela’s always been harsh, herself. This would seem to be the definitive ending — but these things have a way of popping back up down the line. David, here it is, my philosophy is basically this, and this is something that I live by, and I always have and I always will: Don’t ever, for any reason, do anything to anybody, for any reason, ever, no matter what, no matter where, or who, or who you are with, or where you are going, or where you’ve been. Ever. For any reason, whatsoever. That kind of wisdom should solve the Angela-Andy-Dwight issue.